You can see it everywhere, on expensive or cheap tee-shirts, in every magazines, on decoration objects, on jewellery : we are invaded by the MOUSTACHE. Everyone (including me) has been asking this question : why ? How did this trend begin ? What does it mean ? Is there a hiden sense I don’t understand ?! Is the moustache a symbol which speaks to an entire generation (apparently not mine as I’m looking for the meaning since a long time) ? 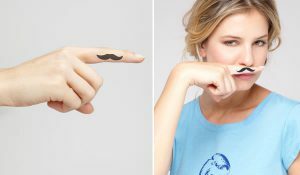 Being confronted by all the requests on promotional products personalized with the Moustache, I decided to investigate and I found answers to our questions ! Contrary to all expectations, you can forget immediately any idea of romantic symbolism : it isn”t. There is no hidden sense, no protestor metaphor from a generation or a special mouvement ; there is no reminder to a unifying value of a society, no there is absolutely NOTHING (except business). This trend is born in the USA thanks to (because of ?) a tattooer who had the idea to draw the famous Moustache on a friend’s finger to create the illusion he had a moustache by putting his index finger on his mouth. No need to do more to create a buzz on the Internet. Bam, everyone play the game, follow the example and post pictures on Facebook and Twitter with the “moustachioed” finger. The phenomenon becomes huge and even gets a name : the fingerstache. This happened in 2003. The same year, Eleven Paris, the super trendy fashion label is born and created his legendary Tee-shirt range “Life is a joke.” This range uses famous people pictures like Megan Fox, Robert Pattinson, Johnny Depp, Will Smith and even Barack obama with the famous fingerstache ! Here comes a worldwide buzz (and a perfect start for the young French brand !). These tee-shirts are snapped out by everyone and the Moustache design is taken by every brands and comes in all sort of shapes, colors and products : the inescapable temporary tattoos that even brands like Louis Pion developp, personnalized bags, clothes of all types (even for babies), jewellery (silicon wristbands with Moustache lucky-charm, Shamballa wristbands moustache, moustache earrings, moustache ring…). The moustache works so well that it’s also applied to decoration sector. Now, you can find Moustache pillows, Moustache belts, Moustache doormat and decorative ice cube molds. Anyway, we’re not done to see Moustache everywhere as it keeps growing sales. I’m just waiting people brings razor and shaving foam. What about you ?